The Climate Adaptation Fund was recognized as a first of its kind program that provides direct support through a grant program to conservation organizations engaging in science-based, intentional, planned climate adaptation of ecosystems and resource management. The grant application structure and criteria help organizations connect the dots between science, planning, and action, with funding dedicated to delivering on-the-ground project implementation. WCS staff work with grantees to ensure the work is completed and that the story is shared with others. The combination of incentivization, actual implementation, and effective storytelling is having a cascading national influence beyond that of any other single grant program or NGO in the US. The Climate Adaptation Leadership Award for Natural Resources (Award) was established to recognize exemplary leadership by federal, state, tribal, local, and non-governmental entities to reduce climate-related threats and enhance the resilience of the nation's living natural resources (fish, wildlife and plants) and the communities that depend on them. The Award recognizes outstanding leadership by organizations and/or individuals to advance the resilience of living natural resources in a changing climate by helping address the goals of the National Fish, Wildlife, and Plants Climate Adaptation Strategy. 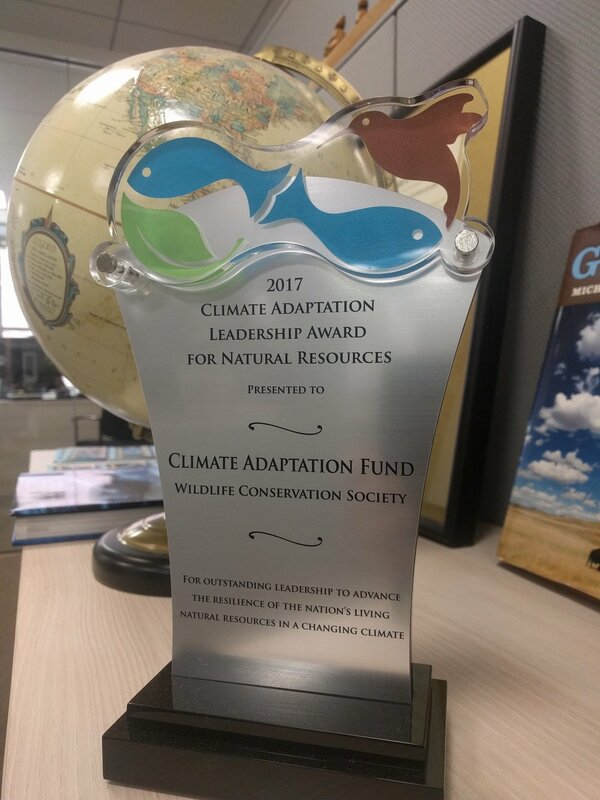 For their outstanding work in raising awareness and helping the nation's natural resources become more resilient to the impacts of a rapidly changing world, eight organizations and individuals were honored on May 8, 2017 by their peers at the National Adaptation Forum as recipients of the Climate Adaption Leadership Award for Natural Resources. Recipients were selected from 27 nominations representing activities from individuals and federal, tribal, state, local and non-governmental organizations from around the country. Integration of local communities into our on the ground activities helping species adapt to climate change is essential for stewardship of natural resources in perpetuity.